August 28, 2014  In an exclusive interview with NPR, the head of the Centers for Disease Control and Prevention shares his impressions from a visit to West Africa. August 15, 2014  In the Liberian capital of Monrovia, one community set up their own quarantine of a family they believed to be infected with Ebola. 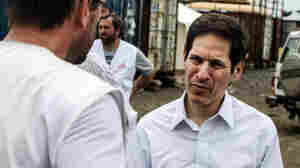 August 14, 2014  Doctors Without Borders is preparing to re-open an Ebola isolation unit in Liberia. The country will again have two Ebola treatment centers, but Doctors Without Borders says it is still not enough. August 13, 2014  Liberia is now the nation reporting the highest number of new cases in the region. It was also a traveler from Liberia who last month carried the Ebola virus to Nigeria and sparked the outbreak there. August 12, 2014  Ebola has claimed another victim. Reeling from the loss of staff and unable to cope with the deadly virus, St. Joseph's Catholic Hospital has closed its gates. August 12, 2014  A Spanish priest who was infected with the Ebola virus in Liberia has died at a hospital in Madrid. 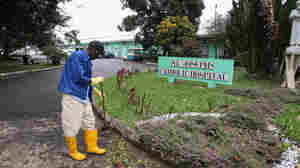 The Liberian hospital that Father Miguel Pajares had been working at in Monrovia is now shut down, because so many staff members have been infected with Ebola. August 3, 2014  Being a health worker usually isn't controversial. But in Pakistan, it can get you killed. Fatima Noor explains why she still goes door to door to immunize kids, even though she's scared. July 31, 2014  A surge of new cases in West Africa's Ebola virus outbreak has health officials worried that the epidemic is getting worse. 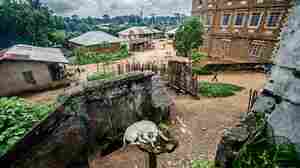 Sierra Leone, for one, has declared a state of emergency, sending in troops to quarantine some of the hardest hit communities. July 29, 2014  The effort to end polio is taking a toll on Pakistan's already overstretched health system. With more children dying of measles and diarrhea, some question whether the focus on polio is worth it. July 28, 2014  The militant group threatens to kill parents who immunize their children. As a result, polio has come roaring back in Pakistan. 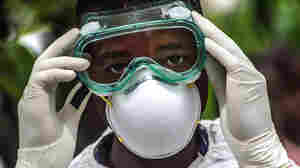 Eradication now hinges on whether the country can control the virus. July 22, 2014  The largest outbreak in history is giving birth to what may be the largest outbreak of Ebola rumors. It's a curse! It's carried by mosquitoes. Or ... a snake. Here's a look at what people are saying. July 22, 2014  There is no cure for Ebola. But doctors are able to treat the virus successfully, raising hope that the outbreak that began in West Africa in March will eventually be brought under control. July 20, 2014  Ebola virus in Sierra Leone is killing dozens by the week. Medical workers have responded by expanding a field hospital, taking extraordinary measures to contain infection. July 17, 2014  In eastern Sierra Leone, health officials have set up the world's largest treatment for the Ebola virus. Businesses in the area are suffering, and people are finding it difficult to earn a living. July 16, 2014  Since the outbreak began last March, more than 600 people have died. This mounting death toll is presenting families and health authorities with a grim new problem: What do you do with the bodies?